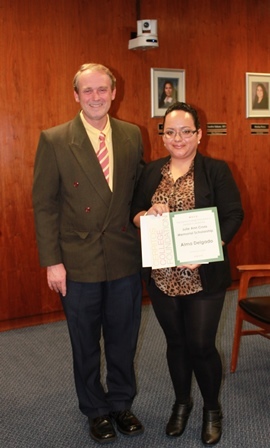 NORWALK, Calif. – December 8, 2014 – Cerritos College student Alma Delgado received theJulie Ann Cross Memorial Scholarship at a recent Board of Trustees meeting. Delgado, a Long Beach resident, was honored with the $500 Scholarship established in memory of Julie Ann Cross, mother of Cerritos College Trustee John Paul Drayer. Ms. Cross attended Cerritos College as a re-entry student and accounting major after the birth of her two oldest children. The scholarship is awarded to a re-entry student with children. Delgado began attending Cerritos College in fall 2012 and is pursuing her degree in business accounting. She is a single mother of two children and is determined to provide the best possible life for them. She is transferring to the University of California, Los Angeles to complete her bachelor’s degree in economics and would like to work at one of the Big Four accounting firms.